This is your funnel waiting to be created. Creating an awesome funnel brings you more customers, clients, fans (or whatever you’d like to call the people that love what you do!) and takes them through a journey that builds a relationship, trust and lifetime fans! If you don’t have a funnel setup yet, then there are some fun times ahead. The first step is to identify what your goal is! I don’t mean make money..more like what is that big ticket item in your belt that you would love to sell. 1. First name what your biggest ticket item is that you could make bookoo bucks (thanks urban dictionary). This will be the purple part of the above funnel. 4. Then, onto my favorite color green. When they have your free offer(s) (ebook, free call, etc…) then what? What is your low cost item(s)? Give people a taste of the big picture. 5. Midrange cost item is blue. 6. This is your goal. This is the big ticket. This is what you want to be doing in your life. One thing to keep in mind. 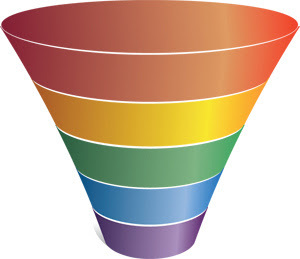 Marketing is only one small part of your funnel. The main focus should be the products. What can they not live without? Apple created the iPhone and suddenly we need something we didn’t know we needed. What is your iPhone?